Earlier this spring, our Food & Beverage team launched an exclusive pop-up experience for our client Wines of Germany as part of their larger campaign Taste the New. Leveraging the growing pop-up restaurant trend, Wines of Germany partnered with local, renowned chef Rodney Wages of the pop-up R.T.B. Fillmore to host exclusive, limited engagement dining experiences that paired unique local cuisine with German Pinot Noir, Pinot Blanc, and Pinot Gris. 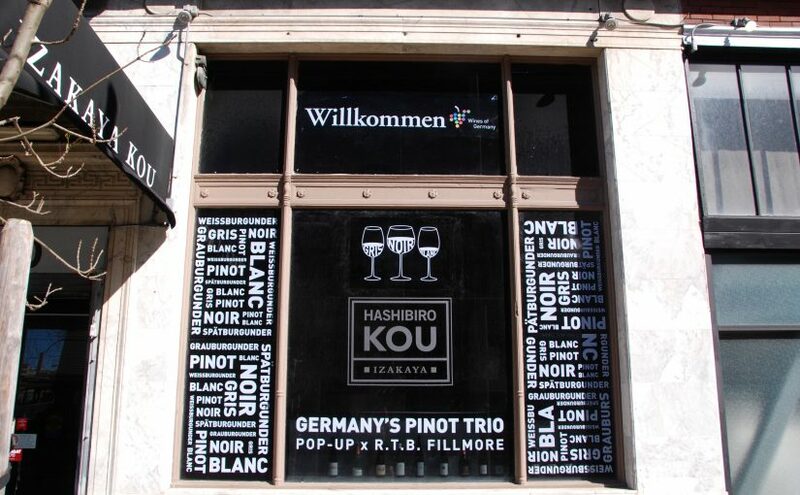 Drive awareness of German Pinot varietals and a new image for German wines in the U.S. while creating buzz among key thought leaders in the San Francisco market – including top sommeliers, trade professionals, media, social influencers and influential millennial consumers. In the über competitive San Francisco restaurant scene, some of the most sought-after tables are at a growing number of pop-up restaurants. Chefs are making names for themselves through “spontaneous” seatings that offer five-star cuisine in casual, unexpected places. And with some of the city’s top Chefs and restaurants, including el Popolo, Mission Chinese and Californios getting their start as pop-ups – in-the-know consumers, media and members of the trade look to the city’s pop-up restaurant scene for the latest in what’s trending in the San Francisco culinary community. Exclusive guided German Pinot tasting curated by Anne Krebiehl, MW with a distinctive paired luncheon prepared by Chef Rodney Wages for members of the trade and media. One-night only, limited engagement ticketed pop-up dinner series that included select German Pinot pairings with local cuisine from Chef Rodney Wages for influential consumers and social influencers. To drive increased awareness in market and create a buzz for the limited engagement dinner series, the RF|Binder Food & Beverage team secured media coverage in top local publications and partnered with local social influencers to drive credibility and excitement among targeted millennial consumers. Geo-targeted posts on Wines of Germany’s Facebook, Twitter and Instagram accounts also drove consumer and influencer engagement. The space, which is typically a fast, casual restaurant, was transformed by The Grove to reflect the distinctive style of Wines of Germany through a variety of branded elements including window treatments, tabletop signage and an interactive wine table that educated guests on German Pinots. The R.T.B. pop-up dinners were leveraged to secure local media coverage, driving nearly 50 million media impressions in the San Francisco market, including Eater SF, Mercury News, San Francisco Gate and Pacific Sun. 20 top sommeliers, members of the media and trade professionals attended the trade and influencer pairing and lunch. More than 60 influential millennial consumers, media and digital influencers attended the one-night only, limited engagement pop-up dinner series. The event drove a social media conversation among the media, influencers and consumers, reaching a social media audience of 1,065,000 with over 6,000 total engagements in the form of likes, comments and retweets.